Columbus, OH - Beginning with the harness racing foal crop of 2019, the primary means of USTA horse identification will be the microchip. "Microchipping provides a more safe, efficient and reliable way to identify horses," said USTA Director of Registry T.C. Lane. "The microchipping process is less stressful for the horse than freeze branding or a lip tattoo. In addition to its identification capability, the Merck microchips also can read the horse's body temperature quickly in a non-invasive fashion, which is a great benefit in monitoring the horse's health." To watch a video explanation and demonstration of the microchipping process hosted by the USTA's Wendy Ross with Midland Acres' doctors John Mossbarger and Bob Schwartz, click here. Not all horses will need to be microchipped immediately, but by 2021, all horses that race in the United States at all USTA member tracks (including county fairs) will be required to be identified with a microchip. All USTA ID Technicians are trained to implant microchips and will also continue to collect a DNA sample from each horse to send to the approved laboratory. All horses that have been previously freeze branded by the USTA will be required to be microchipped by a USTA ID Technician. Horse owners have the option to microchip stallions as well as broodmares. For foals of 2019, the microchipping fee is incorporated into the registration. All others with an existing freeze brand (racehorses, broodmares, stallions, etc.) can be implanted for a fee of $35 per head. The USTA has agreed to allow those that choose to continue to freeze brand the foals of 2019 to do so. That $75 fee must be prepaid to the USTA in addition to the normal registration fee and there are no discounts for multiple horses at any location with this arrangement. 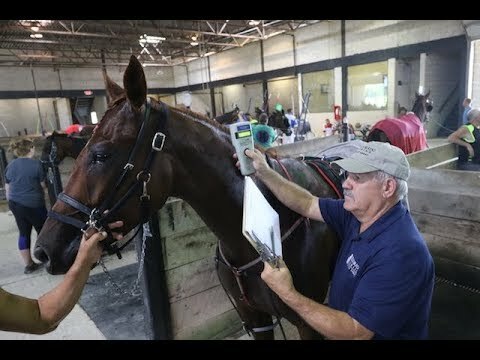 All USTA extended pari-mutuel racetracks will be equipped with readers to identify horses and county fair officials that will be responsible for identifying horses will be required to have them as well. As a USTA Member Benefit through our partnership with Merck Animal Health/HomeAgain, Bio thermal Scanners are available at the discounted, introductory rate of $279 for a BlueTooth model and $69 for the smaller standard unit. Industry participants (tracks/individual members/associations) can purchase a universal scanner for their own purposes at a reduced rate via our supplier by contacting the USTA at 1.877.800.8782 or by ordering via myaccount.ustrotting.com. In addition, Merck has agreed to partner with the USTA, for free, a lifetime subscription to their HomeAgain rescue services, which is a proactive network of veterinarians, rescue facilities and volunteers who are immediately notified in an attempt to help locate lost animals. The program maintains owner contact information that proactively prompts owners to update it during the annual membership renewal process and through other member communications. This is an added benefit for horses that are in need of rescue or connected via the USTA's Full Circle program. • Microchips in general offer a faster/more efficient and less stressful means of identification and require less time to implant than freeze branding or lip tattooing, providing greater convenience for farm visits. • Can measure a temperature in only a few seconds compared to rectal reading that might take several minutes. • Is a safe, unobtrusive way to uniquely identify individual horses. • Provides a less stressful way to alert owners of health problems through temperature sensing (EHV-1), which makes preventive care easier. • Allows for monitoring temperature during and after surgery or procedure, where minimal disturbance is desired. • Alerts owner to possible sub-clinical indications of potential infectious diseases. • Ideal for both young and pregnant stock. Improved technology has eliminated the concerns about the microchip moving after implantation. With Merck’s patented Bio-Bond® process, the microchips are encased in an insert micro-capsule made of bio-compatible material. The process enables the animal's tissue to permanently anchor the microchip at the desired anatomical site. HomeAgain/Destron Fearing microchips stay where they should for the health of the animals and for reading convenience. Any registration or identification question can be addressed by contacting the USTA Member Services team at memberservices@ustrotting.com or by calling the USTA office at 1.877.800.8782.